Shop Handmade UK: New Discounts + Blog Giveway! Silver Leaves are offering Shop Handmade UK readers a generous 20% discount on all purchases unti 7th Sept. Use code SH0709 to get your discount. 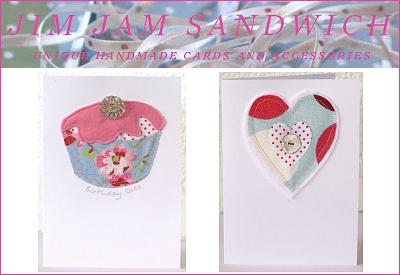 Jim Jam Sandwich are having their first blog giveaway. Leave a comment to have a chance at winning 2 gorgeous handmade cards. Kat from Made With Love is offering Shop Handmade UK readers a 10% discount on all goods in her Folksy store until 31st August. Just DM via Folksy code: SHUK to receive your discount.